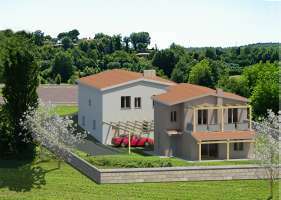 For sale in the municipality of San Giustino, detached single-family and two-family new construction of various sizes. The detached house is 115 square meters all on one floor and consists of living / dining room, kitchen, three bedrooms, two bathrooms, garage of 30 square meters and 400 square meters of garden surrounding the property. The homes will be built respecting the latest regulations with attention to detail: photovoltaic panels for hot water and electricity, floor heating and chimney for a fireplace, recovery of rainwater, double glazing with 'thermal and acoustic insulation. Autonomous villas equipped with modern techniques and combined with a nice building!